Algae Printing for the production of printable biophotovoltaic (BPV) wallpaper. A4 sized BPV was designed in bespoke circuit pattern. Developed with Dr Andrea Fantuzzi. Bioelectricity here means the flow of electrons that occurs as a result of biological reactions occurring in plants and algae. Such electrical flows can be considered a form of renewable energy as they are ultimately driven by solar energy. The process of electron production is called electrogenesis: Photopigments within each cell capture and absorb photons of light to generate high-energy electrons. During photosynthesis virtually every photon absorbed by chlorophyll pigments within the cell can eject one electron; this is the mechanism behind the genesis of electrons (which are able at low efficiency to escape from the cells and be harvested in the form of an electron current). Different types of biological material have been shown to be able to produce an electrical current in response to light. They include plants such as moss but also simpler chemical systems composed of isolated purified photosystems (macromolecules responsible for photosynthetic reactions). However, algae are particularly advantageous due to their physiological simplicity and the fact that live cells are able to rebuild photosynthetic complexes when they become damaged and so maintain long-lived electron flow (Komenda, Michoux, Nixon 2012). Depositing microscopic cells onto surfaces such as a conducting electrode is commonly done by pipetting thick cell suspensions or letting cells settle from liquid cultures. 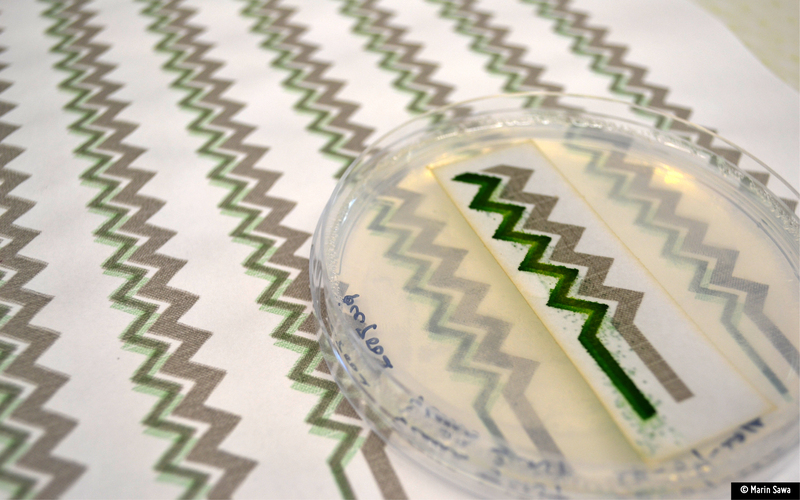 Algae Printing offers a new method of fabricating the bioelectrode that enables the maker (be it a designer or scientist) to pattern the cells precisely at a defined cell density thereby allowing unprecedented design flexibility. Once printed, cells can grow in the presence of suitable culture system to increase the cell density and the amount of chlorophyll for electrogenesis. We have exploited algae printing to develop a new approach for making the bioelectrodes within BPV devices. We showed that growth of printed cells was biocompatible with conductive ink and were able to develop an all printable paper-based ‘semi-dry’ bioelectrode that could be incorporated into BPV cells. This technology is a step change in BPV technology as it moves cells from the aqueous to the solid environment. We have done a series of laboratory experiments to see how the new system functions in terms of light-dark power output and power stability over time. Our recent data show that stability is excellent but that the maximum power output is still relatively small: in the range of 10-20 µW/m2. However with optimisation, we are confident that the system will at least match the 120 µW/m2 of conventional liquid-culture BPV cells (McCormick et al. 2011). Andrea measuring the photocurrent of the Printable BPV sample, in collaboration with the Nixon group. Although BPV cells produce much less energy than algal fuels, which are estimated to produce 4W/m2 outdoors in the UK (MacKay 2009), the harvested energy is in the form of an electrical current which is excellent for applications requiring an immediate electrical input; in contrast biofuels such as bioethanol and biodiesel require substantial input of time, energy and expense in downstream processing such as cell harvesting and refining. Advantages of the paper-based thin-film form are the intrinsic economy of material and energy and the scalability of inkjet printing. We all know what that means. Producing biophotovoltaic cells could become as simple as printing out holiday photos on photographic paper. With the bioink and biopaper, we have the potential to print out a semi-living system that generates electrons and produce electricity. Ultimately one can envision patterned bioenergy paper consisting of a layer of conducting nanoparticles, topped with layers of colourful micron-scale cells. In the thickness of a few millimetres, the microcosm of electrogenesis is processed, ready to be installed to the interior environment. Two A4 sheets of the Printable BPV could in theory power one low-power LED. Developed with Dr Andrea Fantuzzi. Our proof of concept has demonstrated that a household printer can be used as an integrative tool combining processes from designing to fabrication. With the promise of better power output and the development of low-power devices, the making and application of BPV wallpaper could be a few clicks away. Algae Printing and its printable BPV open up a new future for emergent biophotovoltaic technology. They together suggest potential for new kind of scalability from the laboratory to the end user by almost bypassing industry, thereby opening up the closed doors to the cutting edge algal biotechnology. Potential can be in the domestication, involving us the maker as intrinsic elements of the process. Berk, R.S. & Canfield, J.H., 1964. Bioelectrochemical Energy Conversion. Applied Microbiology, 12(1), pp.10–12. Komenda J, Michoux F, Nixon, P.J., 2012. Keeping the green world alive: the repair cycle of photosystem II. In Amendola & Meneghetti, ed. Self-healing at the nanoscale. Abingdon: Taylor & Francis Group, pp. 3–22. MacKay, D.J.C., 2009. Sustainable Energy — without the hot air. Cambridge:UIT Cambridge. Available at: http://www.withouthotair.com. McCormick, A. J. et al., 2011. Photosynthetic biofilms in pure culture harness solar energy in a mediatorless bio-photovoltaic cell (BPV) system. Energy & Environmental Science, 4(11), p.4699- 4709.